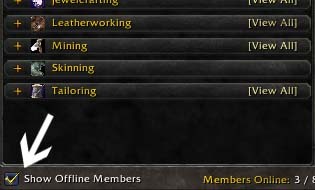 The new guild interface has provided a very convenient way to search for crafters among your guildmates. It allows you access everyone’s recipes, whether they are on or offline, and search them in the same way you would search your own professions window to see what you have in a particular level range or look for a specific item. 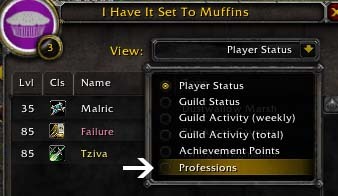 From the crafters menu, you can expand out a particular profession to see who knows the recipe by clicking the little plus sign in the corner by the profession on this tab. 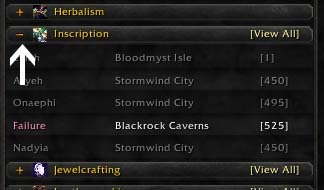 You will be able to view all the people in the guild with that particular crafting profession (assuming you’ve checked to show ‘offline’). It will show their crafting level on the right so you can tell who has the appropriate skill level for what you need. You can click on any of their names — online or offline — to view their individual crafting list. People are currently online will be lit up and you will be able to see their current location in case they are nearby. The other option, and the one I prefer in most circumstances, is to search a crafting window that includes a conglomeration of everyone in the guild’s crafting professions, rather than looking up each person individually. To do this, instead of clicking the plus sign by the profession name, click on ‘view all’ on the right side. 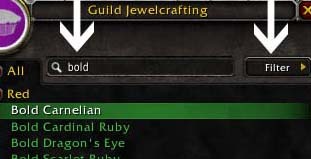 This brings up a window that includes every crafting recipe of that profession that is known by anyone in the guild. Now, using the popout menu on the right, you can search the recipes for the particular one you are looking for. You can also use the filter on the right to narrow the list by subcategories. 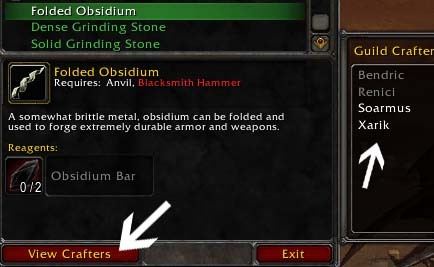 When you’re all done finding the recipe you need crafted, select the item on the menu that you desire and then hit ‘view crafters’ on the bottom of the window. 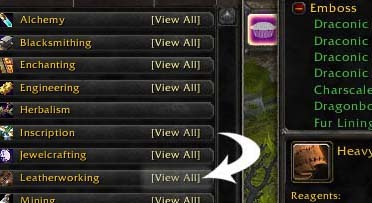 A box will pop up to the right that lists everyone in the guild who has that particular recipe. The people who are currently online will be lit up, but you will also see the offline players (assuming you selected that at the start) so you can tell if perhaps one of them is on an alt or someone you see frequently. Then it’s just a matter of mailing them the materials or meeting them somewhere when you’re both available.